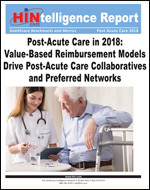 White Paper Abstract: Value-based healthcare payment models, such as clinical integration, shared savings, bundled payments, shared risk and full capitation, as well as the need to coordinate care across the acute and post-acute care (PAC) continuum, are reshaping the PAC landscape. With the start of Medicare readmission penalties for skilled nursing facilities starting in October of this year, PAC providers will continue to examine strategies for improving care quality and reducing costs. The percentage of healthcare organizations with a program aimed at improving PAC quality and reducing PAC costs increased from 95 percent in 2015 to 98 percent in 2018, according to the latest Post-Acute Care Survey by the Healthcare Intelligence Network (HIN). Care transition management, PAC collaboratives and preferred PAC networks are the leading strategies in play for these programs aimed at quality improvement and cost reduction. While these programs are a mainstay at most healthcare organizations, stakeholder engagement continues to be a challenge for these initiatives. Download this HINtelligence report for more data on the most challenging health conditions to manage in post-acute settings, the most common tools used to improve PAC delivery, the impact of PAC programs on care coordination, hospital readmissions and patient experience and much, much more.